I need help with time format. 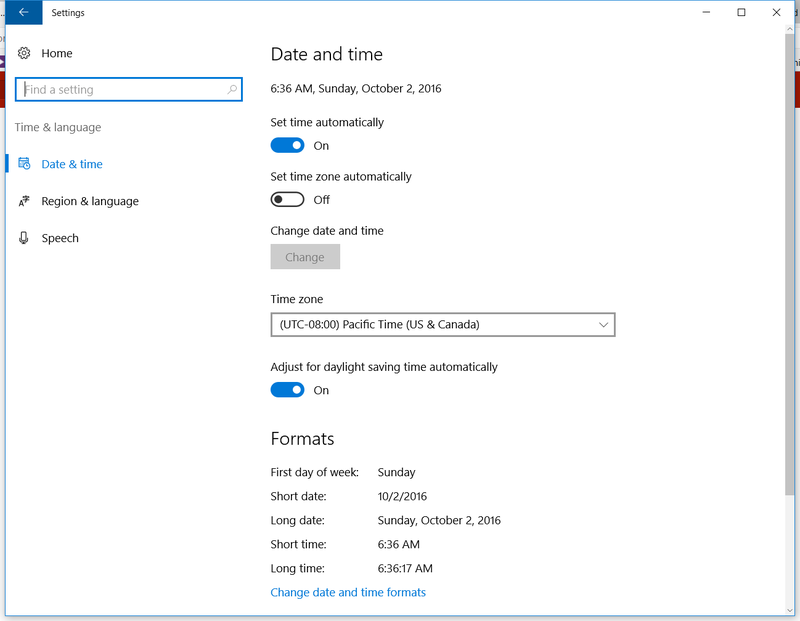 when I am trying to change time format on my windows 10 from 24 hour to AM an PM format there is no choice h:mm tt neither in long or short time. This issue appeared after upgrading from windows 7 to windows 10 through Microsoft web page. on windows 7 I could change without any problems. Can someone help me with this issue? Can you share what this screen looks like? In reply to: Can you share what this screen looks like? unfortunately i tried but was not able to attach photo here. i have the same as on the photo just i have set time zone automatically. short and log time of course show 17:36 instead. Whilst going in "change date and time formats" I have only 24 hour option when i press on it, this is the problem. I wonder what country yours is in. It's dependent on the "Region and language" settings. If I set mine to the Netherlands it's 16:04, if I set it to USA it's 4:04 AM. What's your language/country combination set to? And what happens if you change that? That was the reason for my problem. thanks a lot for help the matter was that i have changed my living location and format changed as well. (NT) Wasn't that the same in Windows 7? In reply to: That was the reason for my problem. In reply to: Wasn't that the same in Windows 7?